One of the challenges for modern data integration is the ability to move data between on-premises environments and the cloud, uninterrupted. Azure Data Factory makes this integration seamless with the Data Management Gateway. The Data Management Gateway is an agent, installed on-premises, that works to enable hybrid data transfers between the cloud and an on-premises environment. Today, I’m happy to announce the auto-update capability for the Data Management Gateway. With auto-update, you no longer need to worry about downloading and installing a new gateway every month for bug fixes or new connectors. To get this capability, download and install the most recent gateway if you have not already done so. When an update becomes available, you will see an indicator in the Azure Data Factory’s home blade in the Azure portal. 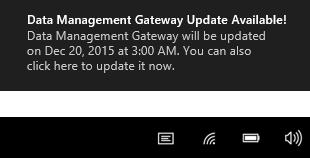 You will also see the scheduled update time in the Data Management Gateway Configuration Manager. On the machine running the gateway, you will see system tray notification messages about the pending update. In the Data Management Gateway Configuration Manager, you have the option to install the update right away, or wait for the gateway to be automatically updated at a scheduled time. 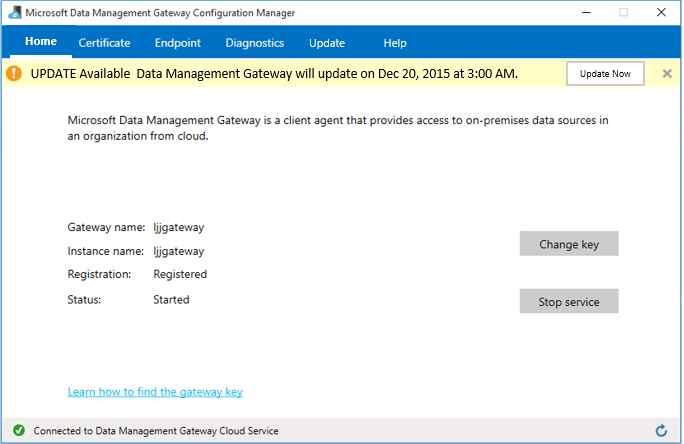 We also added a new Update tab to the Data Management Gateway Configuration Manager. It allows you to schedule the update at a time most convenient for your business processes. If the gateway is processing a task during the scheduled update time, it will not start the update until the task is complete. If the update fails, the gateway knows to automatically revert back to the previous version so your future data transfer jobs are not interrupted.